We have three large parking lots on the South, West and North sides of the restaurant. Call 228-207-0885 to discuss White Pillars catering and events. Call 228-207-0885 to discuss planning your next wedding or event with White Pillars. Farm to table restaurant located on the beautiful Mississippi Gulf Coast, just steps away from the beach and the Mississippi Sound. Located in a gorgeous restored and updated beach front home built in 1905. We use locally sourced farm fresh ingredients to compose a menu that changes daily with availability of fresh ingredients as well as with the changing seasons, known as Contemporary Southern Cuisine. We offer craft cocktails, local beers, wine and a dining experience that is second to none. 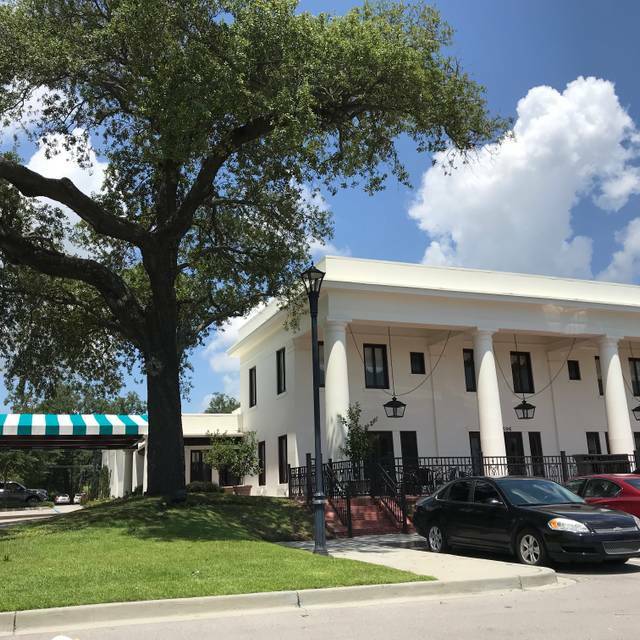 White Pillars has been voted #1 in several categories in the Sun Herald People's Choice Awards for 2018 including Best Chef, Best New Restaurant, Best Happy Hour, and Best Wedding Venue. We have also been recognized as one of the Best New Restaurants in the State by Mississippi Magazine. Great food and service in a lovely atmosphere. The added value was in their use of local products, from food to dinnerware to soaps in the restroom. Quality throughout. Excellent meal with great service! everything was delicious! had the eggplant off the vintage menu and it was outstanding. can't wait to return for another meal! Excellent food. Service was outstanding. Ambiance is classy without being stuffy. They are successfully managing the noise level we had noticed on our previous visit. Great dining experience with friends. Kat was a server like one should be - hard to find these days. Food was very good, reasonably priced and the drinks and dessert were delicious. Building is very nice and interesting. 3 way oysters are a must to have, probably best oysters I've ever had, duck confit was delicious, noodle was made with sweet potato flour which tasted great but has a strange consistency which was a put off for my friend, husband had the pork chop which was very good but a little dry but he ordered it medium. Brother said his snapper was great. Derby pie was good but crust a little hard to cut. Server was top notch. We had drinks prior to dinner, bartender was super friendly, i asked for a martini with olives stuffed with jalapeno.. he said they didn't have them which most bars don't BUT he made them for me, brother said it was the best Manhattan he'd ever had. Go back? You bet! Though I am only empresses w one of Brunch items. Need to offer a few more basics for both Brunch and dinner. Food and service were excellent. We were seated in the main dining room which has a high ceiling, and hard surfaces. After a boisterous party of 12 was seated in the same room, the acoustics made it impossible for our table of three to hear one another. The high noise level continued throughout our meal. The evening was only salvaged when management moved us to a smaller, quieter room for dessert. Unless you prefer a high noise level, I’d suggest requesting a table in the quieter, smaller front room. Great food. Eclectic farm to table menu. Very enjoyable experience. Madison was attentive to our needs and very helpful with suggestions. Will go there again next time we’re in town. After having a wonderful dinner experience on Friday night with friends we really looked forward to Sunday Brunch at White Pillars. We were no disappointed. The WP Lounge had a nice crowd and everyone seemed to be enjoying a more quite St. Patrick's Day. Our meal was again amazingly fresh, creative and delicious. Our service was prompt but friendly and attentive. We both started our meals with the Lenten special Herbed Green Gumbo which was perfect. The fresh seafood sausage was amazing. Likewise we both selected the freshly baked ciabatta bread, Pain Perdu accented fresh pan seared locally sourced ham and crayfish. 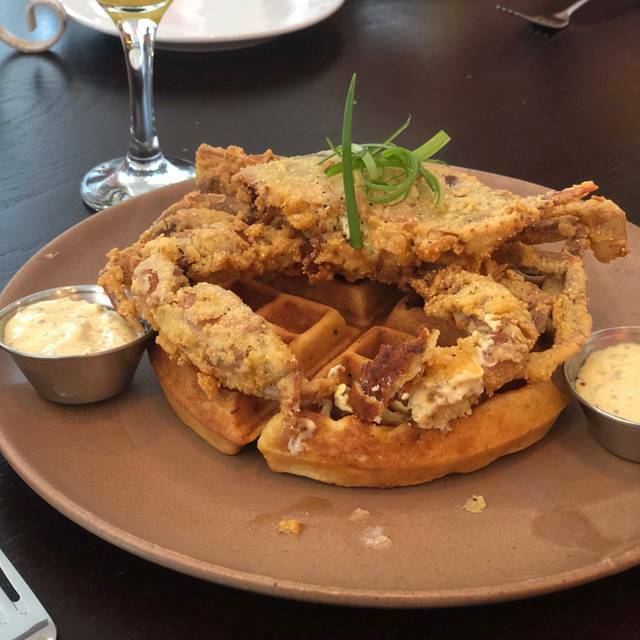 This is a not to be missed interpretation of the New Orleans French Quarter brunch classic. 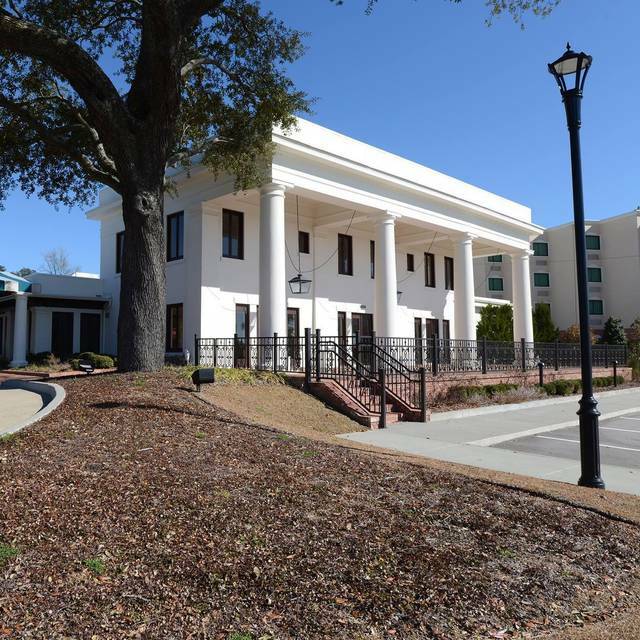 Delightful historic atmosphere and a do not miss if your travels bring you the the Mississippi Gulf Coast. I really enjoyed having brunch with my family at the White Pillars last Sunday. It was delicious, plentiful, and efficient. It was a beautiful morning in a beautiful setting. It was our second time here. The food is great, staff is attentive and understands the menu. What a great meal. Delightful evening which we started in the bar so our UK friends could enjoy most of the SEC Tournament game. Finished our evening in the Terrace Room which is undoubtedly the most comfortable and memorable dining rooms we have ever experienced, very sophisticated yet it had two antiqued framed view windows to the kitchen where Culinary Institute of America graduated Chef Austin Sumrall creates his culinary magic. 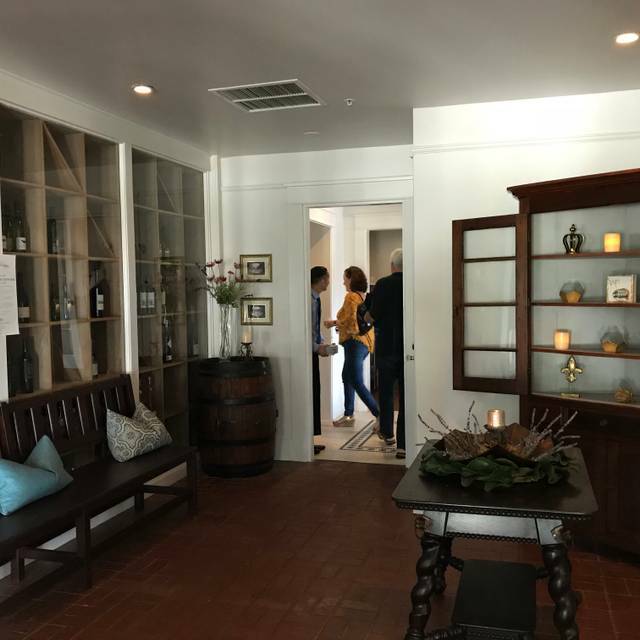 Our guest had the wood oven grilled fresh red snapper, my wife had the red wine braised rabbit and I the pan seared duck breast which was truly exceptional. The property is on the National Register of Historic Places which is a must see. Wonderful as always. Great food, drinks and service. Best dining experience on the coast period. Austin is a thoughtful and inventive chef who makes the best of his well selected ingredients. I can’t say enough. I’m a snobby New Orleans native and I love this place. Outstanding Sunday brunch. This is my second visit and matched the first. We had a great experience at White Pillars! The culture is "slow down and relax". They want you to enjoy the dining experience so it's best to not come in with a fast food mentality. We loved the chef's creativity! Such a lovely ambience and even though it is very elegant, you are fine in casual attire. 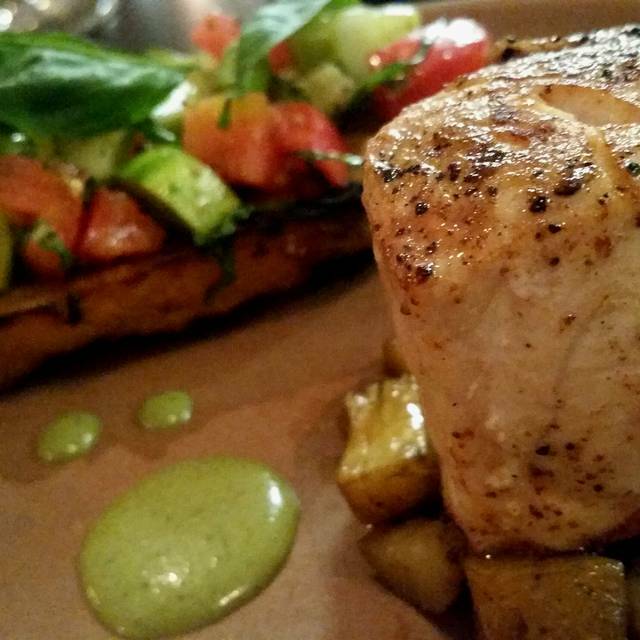 Chef Austin’s food is always fresh, innovative, and delicious! Amazing food, great service, and a wonderful experience for our anniversary! My wife and I made our first visit. We found the restaurant, service and food to be very good. The only reason for a slightly lower score was that one dish of fish was over-cooked. We ate it, but the waitress (Madison) subsequently took the charge off the bill. A nice gesture that we did not expect. For a relaxed and generally upscale meal, we recommend White Pillars. The food here is simply outstanding. I came the next day for brunch and the shrimp and grits was unbelievably fantastic. Never had a better version in my life! Beautiful exterior and interior! Delicious food and great bar! Highly recommend! Exceptional as always! Lovely ladies lunch. Fresh from farm to table...excellent service with custom drinks mixed to perfection. This place has great potential. Perhaps one day it will live up to that potential. 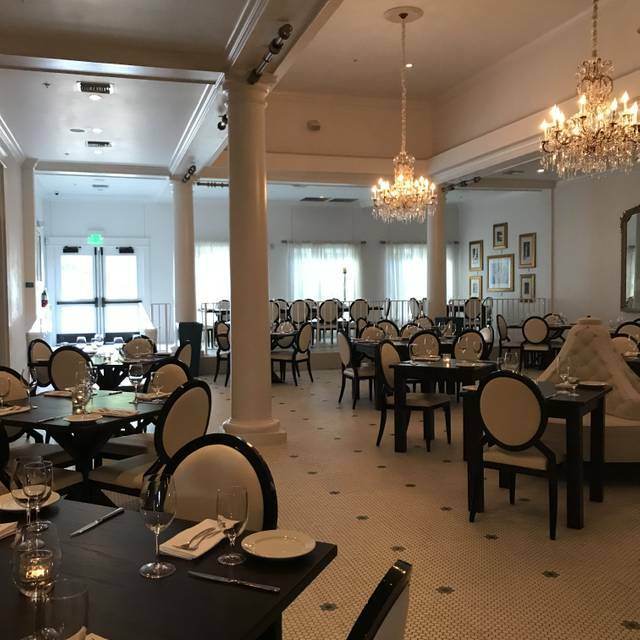 We went to White Pillars for Sunday Brunch and looking forward to it since we have eaten here for Dinner and had enjoyed an excellent meal and experience! However this meal was not so great. First the menu did not have as many traditional Brunch items as you would expect and is more creative, which would be fine, if , these were delicious. Unfortunately they were not. Additionally the restaurant ran out of a few of the items that we wanted to order, such as the French Toast?? And Honey?? for the Chicken and Waffle's. The Shrimp and Grits are delicious as was the Fresh Catch of the day. 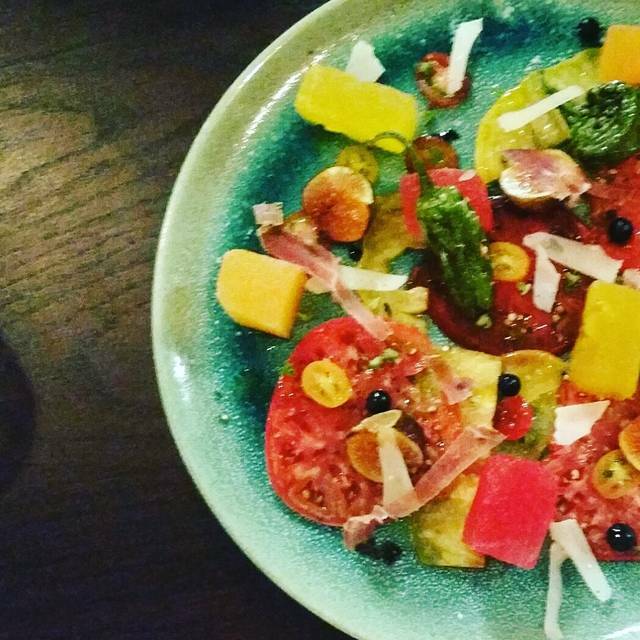 We really like the fresh farm to table concept especially with the emphasis on Mississippi products! So we will give it another try and hopefully they will add some great classics to the line up for Sunday Brunch. Charged for a split plate without notification. I don't mind paying such if notified. Music was inferior and wrong kind of music for a high quality experience. Harpist, jazz piano, or classical would be more appropriate. The style and low quality music cheapened the dining experience for me. Excellent food but the service was slow and needs improvement. We had a lovely visit. The food was delicious and the building was beautiful. The restaurant was excellent in all respects...service, selections, quality of food and its preparation. Did have to wait in the bar prior to being seated in the restaurant and it took much longer than it should have to be even ackowledged. My first time to try White Pillars was Valentine's Day and there was quite a crowd. The cocktails, food and service were excellent. The only issue was how long it took to get served. We had reservations for 8:00 pm and didn't get served until about 10:20 pm. It seemed that the kitchen was overwhelmed - despite the fact that most patrons had reservations. Maybe the add-on traffic from people eating at the bar was just too much to handle. Overall, the restaurant is great. I look forward to trying it again - when it's not so crowded. Four of us went for a valentine's dinner. It was a little bit of a wait, but we expected that. Unfortunately the bar / lounge were short staff, and it was almost impossible to get a drink during our 20 minute wait. However, once we got into the dinner area, everything was very good. The food was excellent, the service very good, the timing of he courses was very good. Overall, things were very good. I decided to take my wife to dinner for Valentine's Day and this was our first visit to White Pillars. Overall, it was a very pleasurable experience. It's advertised as a fine dining restaurant, and for the most part, it lives up to that billing. The restaurant is beautifully appointed, and the staff and service were excellent. We both ordered the Carpetbagger steak, which is a New York Strip, with a topping of bleau cheese crumbles and a few fried oysters. Our steaks were cooked perfectly, and the meal was outstanding. My only complaints - and these are admittedly very minor - is that the main dining room has tile flooring, which makes for a very noisy environment. Also, there were no tablecloths on the table, which I feel a fine dining establishment should have. Otherwise, it was a very pleasurable and enjoyable dining experience, and I will definitely go back. Highly recommended. 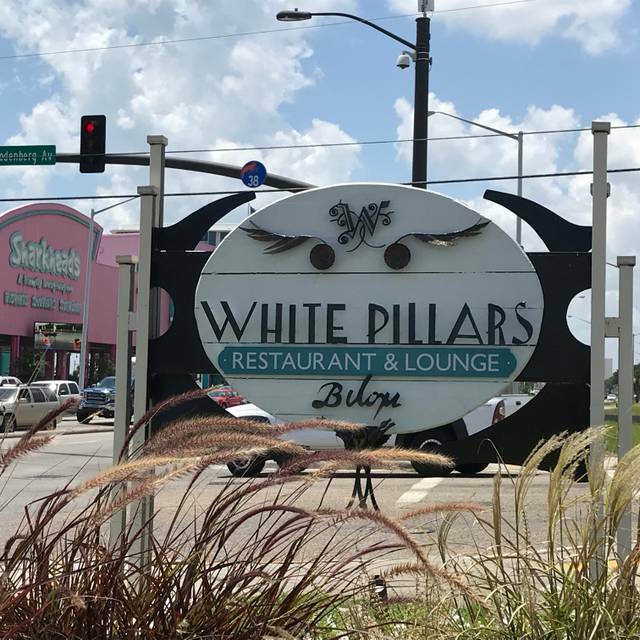 I have been to the White Pillars numerous times and it is always a great dining experience. 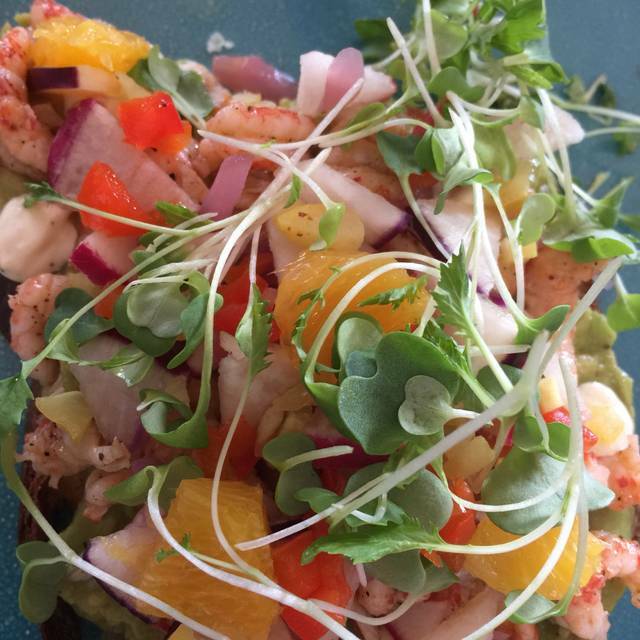 The food selections are creative and made with fresh local ingredients. Highly recommended for Sunday Brunch.